Third party sellers just received an email from Amazon with orders to clear out their Google Chromecast and Apple TV inventories by October 29. The more specific reason for the purge is the fact that Chromecast and Apple TV don’t support Amazon Prime Instant Video. Nevermind the fact that Amazon sells the Fire TV and Fire TV Stick, two products that compete directly with Chromecast and Apple TV. Amazon wants everyone to know that it has the customers’ best interests in mind. It’s kind of amazing, when you think about it. If Apple and Google don’t want to play nice and support Prime video, then Amazon doesn’t want to play nice and carry their stupid products. (Though the weird part is that Google didn’t withhold support from Amazon — any app, including Prime, can be built to work with Chromecast. 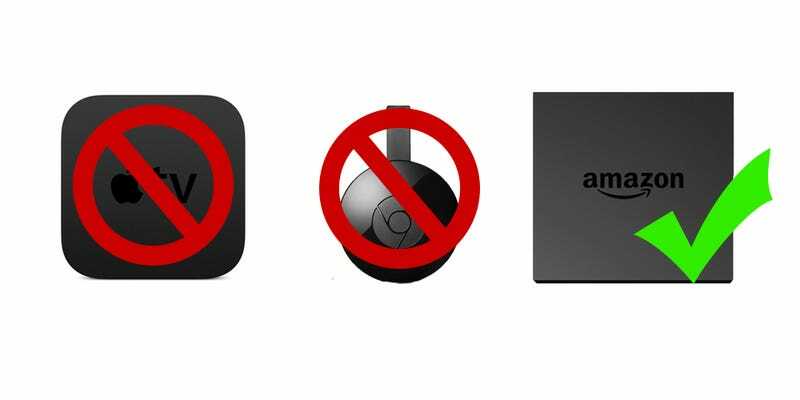 Amazon chose not to make Prime work with Chromecast.) Amazon even made a point to say that Roku, Xbox, and PlayStation products wouldn’t be affected by the ban—presumably because they do play nice. Sick burn, Amazon. Sick. Burn.